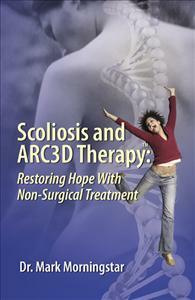 This book provides an introductory overview of the ARC3D Therapy™ system developed by Dr. Mark Morningstar. It breaks down the essential components of scoliosis treatment necessary to improve the quality of life in people with scoliosis. ARC3D Therapy™ uses a combination of exercise-based therapies rooted in treatment methods worldwide, helping people get the whole-body scoliosis care they deserve. Goal setting, outcome assessments, management strategies, risk stratification, and rehabilitation exercises are just some of the topics covered. Written for doctors and patients alike, this book explores the idea that people with scoliosis need more than just orthopedic spine care.